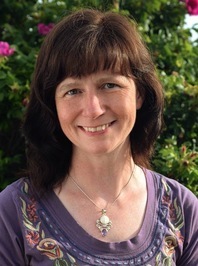 Kelley Grant is here to share the difficulties and joys of finishing a multi-book series. 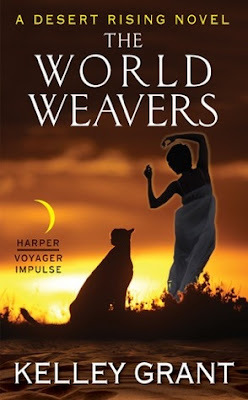 And Kelley should know, her third book just released, THE WORLD WEAVERS! 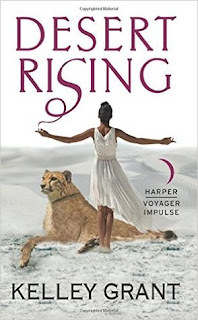 The first book is Desert Rising, followed by The Obsidian Temple. I am a pantser when it comes to writing. Oh, I try to plot and outline – but when I sit down, all that planning flies out the window and the characters decide where the story goes. But pantsing wasn’t working while writing The World Weavers, the concluding novel of the Desert Rising series. I’d set everything up. The deities were crazy and flawed but still powerful. The prophecy was incomplete and would never defeat the deities. A dozen characters, scattered across the territories, traveled toward destiny. The deities’ army outnumbered our heroes’ army 3 to 1. I was weaving a dozen ends together. Characters had to overcome impossible odds if they wanted to win the war. But as I started my usual writing process the characters kept trying to take me in new directions. “That’s boring,” Sulis would say. “I want to explore the desert, not win a war!” And new characters began clamoring to be heard. I began to lose track of who was where, when, and what chapter I left them in and what direction to point this mess in. In other words – I had to start planning and plotting just to keep track of the who, what, and where of each chapter. I created a chapter-by-chapter outline by modifying a spreadsheet my editor gave me for Desert Rising. It included each point-of-view character, how many pages per POV, and what events occurred in the chapter. I added a column for the month and time of year to ensure characters didn’t arrive months after the final battle. I documented each chapter as I finished it in this spreadsheet. This spreadsheet became invaluable when, during the line-editing phase, my editor and I realized The World Weavers needed a new POV character to show the planning of the warriors of the One. By studying the chapter outline I pinpointed nine sections of the novel where this character’s POV would join seamlessly into the story. We were on a tight deadline and I wrote eighteen pages of the new character viewpoint into the novel in four days. I made a separate sheet detailing the plotlines for the characters and how I saw them ending. Each time a character began steering off course, I redirected them to that one goal. I wasn’t entirely successful – we ended up cutting pages of unnecessary details from the novel – but it helped give a focus to the scattered bits of the story. And then, the hardest part. I had to have faith in my characters, the story already written, and my own ability to bring it all together. Although I had researched some military strategy for these books, I am not naturally strategic. And those books were telling me that a tiny force going against a very large one was going to lose. I had to trust in my character’s innate sneakiness, the harsh desert environment and some good (and bad) luck to set up the climax and resolution of the series. The most difficult part of editing World Weavers was simplifying the different threads. I’d done so much research and tried to pack as much of that into the novel as I could, as a way of legitimizing the twists and turns. The story did not need it. It was enough that the research informed my writing. The reader did not need to be bored with the details. My editor and I cut long explaining sections and rearranged chapters for a fluid reading experience. I’d also tried to pack in every last character-building detail; this was the last book, my last chance to feed these tidbits to the readers! Editing those out was a case of “killing your darlings.” I loved those details, but they slowed the story down. I spent quite a bit of time cursing myself for choices I made in the first two novels. I regretted everything from choosing not to capitalize soldiers of Voras (making it impossible to call men in the army soldiers) to larger issues with the religion that I had to work around. I would like to do improve my pantsing methods in my next series, thinking through how each element of the first book will cascade the choices for each remaining book. I imagine that if I had been a plotter I would not have run into such issues. But the joy of writing, for me, is in watching the plot appear as my characters live it. The story is a magic spell, writing itself. I’m lucky enough to be in the right place, at the right time, scribbling down the details. 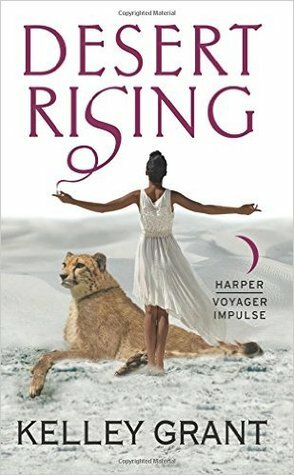 Kelley Grant is the author of the Desert Rising trilogy, which includes Desert Rising, The Obsidian Temple and The World Weavers. She grew up in the hills of Ohio’s Amish country. Her best friends were the books she read, the stories she created and the forest and fields that inspired her. She and her husband live on a wooded hilltop and are owned by five cats, a dog and numerous uninvited critters. Besides writing, Kelley teaches yoga and meditation, sings kirtan with her husband, and designs brochures and media.